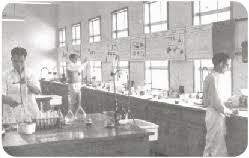 It was quite accidental that I came across few rare monochromatic (black and white) pictures of Research laboratories in India of 1950-60’s era. And I found them interesting enough to make me dig more into their history. The first chemical laboratory of India is the brainchild of Dr. Shanti Swaroop Bhatnagar and was established under his chairmanship. He was a great Indian scientist and is known as ‘The Father of Research Laboratories’. Born in British India, Dr. Bhatnagar was an Indian colloid chemist, academic and scientific administrator. It was he who proposed the Indian government to set up National Chemical Laboratory, construction of which began in 1948 on a land of 475 acres under the supervision of Bombay based architects Master, Sathe and Bhuta. The main building of NCL had laboratory space of area 1,30,000 sft and built at a cost of Rs.35 lakhs. During his career, Dr.Bhatnagar received multiple honours & recognition and he was awarded the title ‘Sir’ by the British in recognition of his service to science. In his later years i.e immediately after India’s post-independence period, he played significant role along with Dr. Homi Bhabha, Vikram Sarabhai and others in building various infrastructures and policies for science and technology. He became the first Director-General of NCL and is largely remembered for having established various chemical laboratories in India. He was the President of the Indian Chemical Society, National Institute of Sciences of India and the Indian National Science Congress. He was awarded Padma Bhushan by the government of India in 1954. The prestigious award in science in India, Shanti Swarup Bhatnagar Prize for Science and Technology was created in his honour. Before the birth of NCL: Industrial Intelligence and Research Bureau was the first industrial research organization that came into existence in 1935. However it was quite inactive and so there was an attempt to abolish it and replace with Board of Scientific and Industrial Research, similar to the British BSIR. Under the chairmanship of Arcot Mudaliar and Director Bhatnagar, Board of Scientific and Industrial Research (BSIR) was formed which lasted for two years. Bhatnagar persuaded the government to set up an Industrial Research Utilisation Committee (IRUC) in early 1941 for further investment into industrial research. Arcot Mudaliar was also successful in securing Industrial Research Fund from the Central Assembly at Delhi. This finally led to the constitution of the Council of Scientific and Industrial Research (CSIR) as an autonomous body, which came into operation on 28 September 1942. BSIR and IRUC became the advisory bodies to the governing body of CSIR and in 1943, the governing body gave its nod to establish five national laboratories in India- The National Chemical Laboratory, Pune; The National Physical Laboratory, New Delhi; the Fuel Research station; and the Glass and Ceramic Research Institute. And this was the beginning of scientific laboratories in India. I was invited as a panelist by Society for Industrial Chemistry (SIC) for one day seminar organized by them at Institute of Chemical Technology (ICT) auditorium, Mumbai earlier known as UDCT. 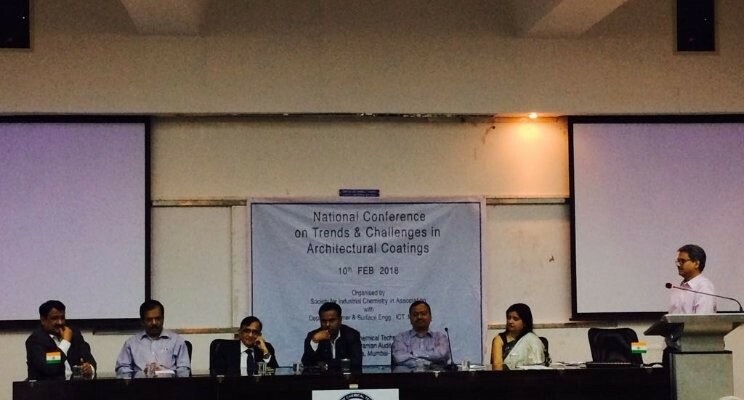 The theme of the seminar was, ‘Trends and challenges in architectural coatings’. Few presentations were very interesting – High performance painting solutions for high rise buildings, painting on wet surfaces, protective coatings etc. The architectural coatings industry has undergone great change over the last ten years. It will not be an exaggeration to say that paints and coating market, has influenced Indian architecture and made it colourful. The coatings that we get today have a much different raw material base and different environmental properties than what we used to get few years back. 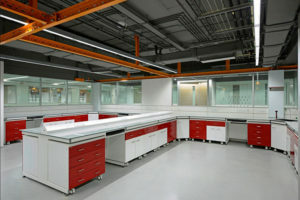 Few of the significant changes have been, the conversion from oil-based to waterborne paints, VOC reduction, removal of unsafe chemicals , the emergence of paint-and-primer-in one products, improved film properties such as dirt pickup resistance and rain resistance, and easy-to-apply new looks. These changes have been brought through, by various influencers such as synthesis chemists, paint formulators and end users. They have made these ‘Coatings’ formulation very innovative. As the consumer tastes change, regulatory rules change and new raw materials become available, I forsee paint formulators being more and more creative in producing new products. Being associated with laboratory design industry for more than 2 decades now, I have closely interacted with paint scientists and their fellow chemists. During the process of lab planning, we get acquainted with their processes and workflow. Architects- being the conceptualizer’s, I would refer them as the first user’s or consumers to such colourful products. However it is not always that a consumer gets an opportunity to know and understand the operations behind these innovations. When we set up labs for paint scientists, they are the users and we are the creators. Listening to the day long presentations made me feel that they are the creators and we (architects) are the primary users. I think the confluence was an excellent platform, for the creators of both the worlds to interact, exchange, understand how the thought processes are and how we can be influencers and users-both, for each other’s industry. This reminds me of a quote by famous scientist, inventor, engineer & innovator Mr.Graham Bell…..
“I never knew how to invent electricity, but I was interested in using it for other innovations. So I found someone who did…And in such divine intervention I found a genius named Nikola Tesla”. With 700 patents to his name, Nikola Tesla is one of the greatest inventor of all times and more known for his innovation of alternative current. The way Bell could innovate on the foundation of electricity, architect make your work space aesthetically beautiful with the innovations in colours. This quote is very much apt when it concerns art and architecture. Colours are the creative forms of expression of an artist. For an architect, the joy of using colours in the form of paints, coatings and all such materials as architectural features is extensive. According to me, they add character to our design. However, what is rare is when a consultant shares a note of gratitude for the client. 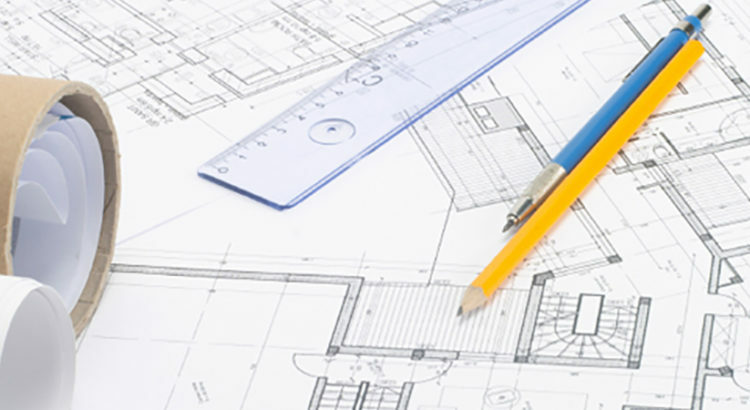 Arena Consultants was appointed as ‘Laboratory Architects’ by M/s Sudarshan Chemicals’ for their upcoming project. We started with redesigning of their R&D center at Sutarwadi, Pune which comprised of R&D lab, plastic lab, analytical lab, administrative areas and analyst seating areas along with multiple meeting and conference rooms. What started initially as 9000 sft area project, soon got extended into a larger scope of renovation of other support areas too. 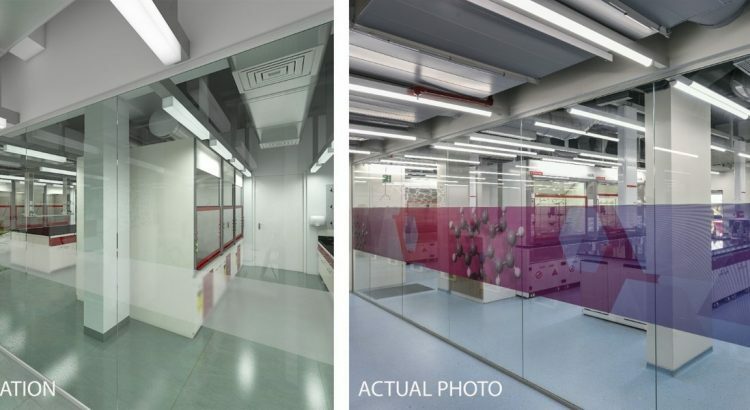 We first presented the preliminary concepts and 3D views which helped the client to envisage of how the labs would look like. While doing so we had total freedom to design and were encouraged to innovate. The design development period was very interesting. We had constant interaction between the users, client engineering team, the facilitators, Arena’s design and engineering team and most importantly the client management team played a crucial role. There was hardly any distinction between the teams. This was possible simply because there was lot of openness and receptiveness to the ideas which were presented. The acceptance level by users was high which motivated us throughout the project process. Architecture is a creative field. It does not go by rule book. Designers need freedom, flexibility, support and trust from clients which is what we got from M/s Sudarshan Chemicals. Arena Consultants sincerely thank all the stakeholders and look forward to a long lasting working relation with Sudarshan Chemicals for years to come. It is so exciting to be a woman. I cannot imagine what it would have been, had I been born as a man. My, it would have been so boring, doing same activities every day. Right from her birth, she plays so many roles that she does not need a stage. She is a princess to her father- a cute daughter, a supporting sister, a compassionate friend, a queen to her husband, a nurturer and loving mother, a cool aunt, a responsible daughter in law, a kind grandmother, a tough boss at work when it comes to and most important a go-getter. Life to her is full of variety and happenings. From kitchen to war rooms, women have demonstrated their assertiveness, skills and competencies. Hey, I should say something new now. And the new thing is, SHE has now accepted her identity as an independent woman and her importance in her own life. The realization of being a woman and knowing her strength has made her stronger, with a head on desire to fulfill her dreams. She has now started living ‘her’ life and has realized that she is no-more lame. She has realized that she has a voice that cannot go unheard if challenged. Little joys matter to her. She is elusive yet aggressive as situation comes to her. She is gentle yet fierce when it is a matter of survival. She is an inspiration…..
Women, we cannot be equated!